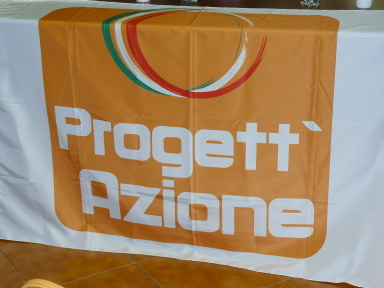 Progett'Azione is a centrist regional party in Piedmont, founded in 2012 as a split from the PdL. They currently hold 4 seats in the regional parliament. The symbol is square with rounded edges, and shows on an orange background the party name in white, and in top the national colours in a somewhat circular arrangement. The flag is white with the symbol [1,2].